Down the old and dark hallways of the century old university buildings and classrooms that are still standing proudly at the University of Toronto is one of the most beautiful buildings in the city. The Hart House is a masterpiece of architecture and style with it's dark brown brick and slit windows on the staircases and gothic style give it a wonderful feeling. Hart House wedding photography is at it's best when we use the light available through the windows to showcase our newly married couple. In this photo the bride and groom are facing each other just off to the right of one of the small windows and the light is coming in and shining on her face as she looks lovingly at her new husband. I love how she is lit up against the black background which pops her off the page. This photo has style, romance, elegance and luxury written all over it. They say a picture is worth a thousand words, but I think this one uses up a few more than that. 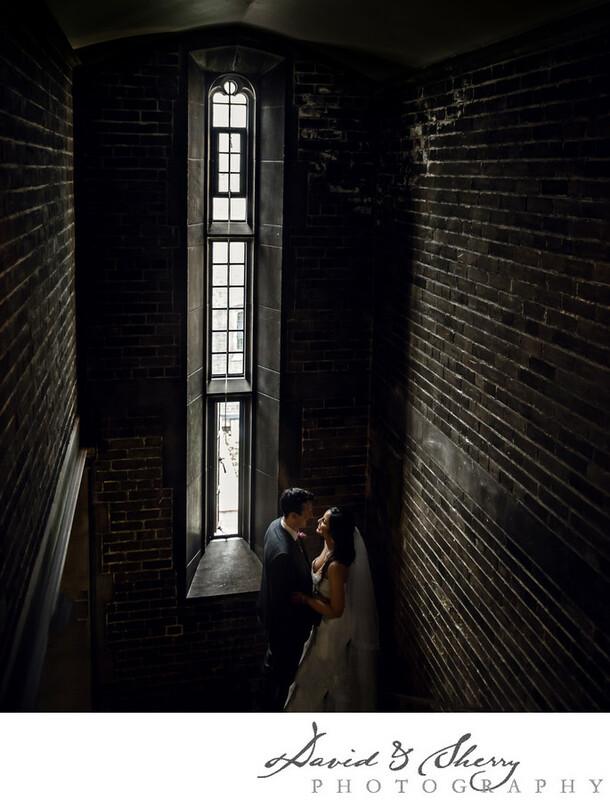 The beautiful hallways and the open courtyard are two things that make Hart House one of the most sought after wedding photo locations in the GTA.